I must say, Lukas seems to have great musical timing. You may remember that I touched on it briefly here, when describing his vocal enthusiasm for music of the live variety . And we have observed his pure enjoyment of modern rock, blues and alternative music when he dances around our house with surprisingly spot-on rhythm. He most certainly did not pick this up from his paternal genetic heritage. Those few who have witnessed me dance would attest to that. As if those things were not enough, he has now demonstrated a brand new skill that while impressive on its own, when coupled with its interesting timing can ONLY (well, at least to me anyway) be attributed to some freakish savant-like talent for all things sonically cool. 1. 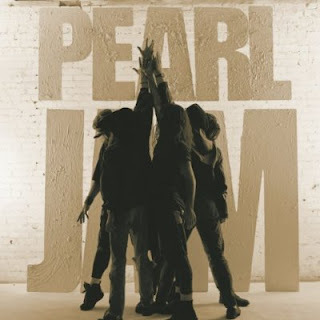 This past Sunday I stopped by my local independent record store and was mesmerized into deep, joyous, and long forgotten musical memories after happening upon a newly released remastered edition of the album that started it all from my hometown favorite band Pearl Jam. 2. That very same afternoon I arrived home to the truly sweet sounds over our monitor of Mrs. LIAYF and Lukas counting together for the first time, from one to Ten. What do you think? What should I buy him first, an Electric Guitar or an Abacus? One of These Days . . .
Me: "Lukas, come sit on Daddy's lap. I want to have a talk with you"
Me: "You sure are sweet. And since you are begining to talk so much recently, I was thinking maybe you could step it up a bit on feeding me funny material for my blog posts." Lukas: "No, I do it daddy"
Me: "You see, I read a lot of other daddy blogs where the kids are always saying something hilarious when they don't realize what they are actually saying. It's blog-gold. I need more of that now that your words are flowing." Me: "Good to know son. Now, about the material. It's like hitting the blog lottery, and you are my winning ticket little buddy." Me: "Ok, so maybe that will come later. No problem. Hey, I also read a lot of blogs where the kids draw funny pictures of mommy or daddy. Those can turn out hilarious as well. Why don't you sit at your table and color a picture of daddy? Won't that be fun?" Editors note: Tune in next post, when I will likely once again explore the sleeping habits of an active 21-month-old. I am a fairly big fan of Science Fiction. Being so, I have undoubtedly watched or read dozens of accounts of travel through time. Backwards. Forwards. Backwards, then Forward. Forward, then back, then forward again. Yeah, you get the picture. And I'm guessing you have also no doubt enjoyed such stories nearly as much as I have. But last night I experienced time travel of a sort - first hand. No, I didn't climb into a vintage 1984 Delorean, fire up the flux-capacitor, and punch it to 88 mph while being chased by a Vanagon full of Libyan terrorist shooting AK47's at me. No, last night it was not the past but the future, and I got there by simply walking across the street. Mrs. LIAYF and I were contacted by our neighbor who was desperate for a babysitter for her two boys ages 8 and 4. Normally, Mrs. LIAYF would be a perfect choice for such matters, however our neighbors needed someone at 6:30, which was before Lukas' bedtime. And, since he is still nursed before bedtime, I tend to have a rather, let's just say. . .difficult, time getting him to sleep myself. So, I was recruited to babysit (not exactly accurate terminology for boys age 8 and 4) until my sweet wife had put Lukas to sleep and could relieve me. I didn't know quite what to expect having never put a couple of older boys to bed. However, I was given the scoop once I arrived. Let them read, play a board game, have them brush their teeth, make sure the 4 year old goes to the bathroom, read them stories, make sure they are in bed with the door open - and I'm golden. The only nervous moment that I had was at the point I wasn't sure my goofy antics during the board game were a bit too much. I had them laughing a lot, which resulted in the boys getting fairly animated. At one point they began to call the board characters by names such as "Poopy-Poop-Pants" in progressively louder cackling voices. That was my cue to settle it down a bit. And you know what? It worked! The boys listened to me . Then it was time for the bedtime routine, which also went off without a hitch. These are a couple of great boys and the whole experience gave me a slight glimpse into a future where I get to act like the big kid I really am while still being a responsible parent. 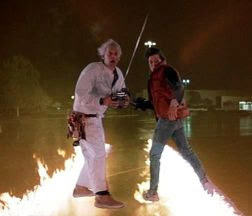 Sign me up, Doc Brown! Now, I have to go. A slow rolling Vanagon just pulled up outside. Ok today is not wordless. Nevertheless, sometimes a look back just helps. That 5:00 wake up call this morning? Not so bad after browsing through my old pictures for proper perspective. I originally posted this as a Wordless Wednesday so there you go on the lack of sleep! You know, just when it seemed that I had reached my absolute internal frustration breaking point with my wife for Bogarting our laptop, thus preventing me from doing my precious blogging, she went and scored us a FREE Little Tikes Tugboat sandbox. The real finds on Craigslist don't last very long at all and she found it mere moments after it was posted. With a little Simple Green and elbow grease Tuggy (hey, that the name emblazoned on it) will be almost a good as new. Man, I love Craigslist. Oh, ahem. . . .and of course Mrs. LIAYF!! Hey Dads, need some intellectual 'Guy Time'? Well, in an effort aimed at sustaining parent literacy during the turbulent toddler years, I am starting 'The Toddler Dad's Book Club'. Slots are still open but filling up fast, so if you have a little one and want a book club tailored to the kind of reading of which you partake, this is the perfect venue for you. Cyber meetings, with virtual beer and steaks, will be held monthly. Interested? Then read on and check out the inaugural selection. This has potential to become the next Internet parenting phenomenon. And remember. . . . .it all started right here. What exactly were Red, Ed, Ted, and Ned doing in Bed? And what happened to poor Fred? What gender is Pat anyway? What became of that cat on which Pat sat? Three Fish in a tree? How can that be? Theories on what species 'Him' is? Liger, perhaps? Let's make it an initial goal that all who sign up read the entire selection before the meeting. Well ok, at least get half way through. That certainly can't be too much to ask. I'm talking Commitment, brothers! Let's show the ladies we have it in us. Want more specifics? - Ask me tomorrow, but not today. Many things have dramatically changed for me in over the past few years, the most obvious of which is that I am now a father. 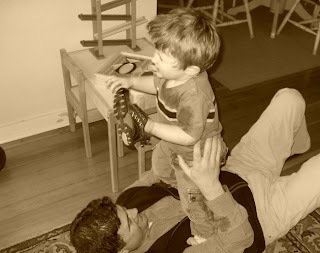 Having entered the realm of parenthood at a seasoned age has given me a different set of life experiences to mold how I interpret parenthood than, I would guess, many other first-time fathers. For a number of years before and after I was married, I was healthy, financially stable, and for the most part otherwise unencumbered by today's worries. I was able to travel to exotic destinations on short notice, eat unhealthy food without without giving it a second thought, and watch or listen to what I wanted-when I wanted. Likewise, I was also able to view the latest movies on opening weekend, recognize holes my wardrobe and fill them with a quick trip or click of the mouse, and accept last-minute invitations from friends to join them for spontaneous events. Of course, becoming a parent changed all of that for me. As most of you parents out there already know, you effectively can throw true spontaneity out the window when becoming a new parent. And, I don't know about you, but the extra cash that provided the means for me to splurge in some of the above mentioned ways....well, that now gets sucked into the proverbial child-rearing vacuum. And extra time? What is that of which you speak? In other words, for me the finer things in life are no longer defined for me in terms of material items. On a daily basis, they are now my wife and my son. Don't get me wrong, I am not complaining about this. Quite the contrary really. What I have actually found recently is that when I do get the now rare chance to experience some of the pleasures I took for granted just a couple of years ago, the appreciation level has been profound. For example, it has been so long since I had steak, that when merely driving past a steakhouse the other day and smelling the sweet aroma wafting outside, I had an immediate pavlovian reaction and found myself drooling idiotically. I can only imagine how good it will taste when I actually have my next one. Similarly, I no longer have a nightly bottle of micro-brewed ale, but every few weeks or so when I do, I take a deep breath and let the that first swallow slowly work its glorious way down through my body. It's nice. I have had similar enhanced appreciation for movies, sporting events, travel, or just a few quiet moments alone to gather my thoughts. As the saying goes, absence makes the heart grow fonder, and also the appreciation to rise to new heights. As a new parent and a man experiencing life through a new prism, I can certainly attest to the veracity of this. Let me know next time you are in Seattle. Perhaps we can grab a juicy steak and a cold pint or two. Just don't be alarmed if my eyes seem to roll to back in my head. . .if only for a moment or two. It turns out I have a title that I was completely unaware I possessed. Negotiator. Lukas is at that age where he is beginning to assert his independence with increased frequency. As most parents of children over 18 months of age already know, this strong willed nature often manifests itself at inopportune times. This is when parenting becomes challenging for a whole new set of reasons than the ones we had to deal with in that first year and a half. Making sure our children get the proper amount of rest, have the proper amount mix of mental and physical stimulation, and eat a healthy and balanced meal would seem straightforward enough. Especially if you read all those parenting books. However, these tasks become even more challenging when your newly independent-minded child decides he want to figure out the world at his own pace and in his own way and is not always inclined to play by your rules. So, it has been a learning experience for us as Mrs. LIAYF and I have looked for new ways to accomplish those above stated goals without resorting to other common forms of discipline which we have agreed not to use. Our mantra since his birth has been "Distraction, Distraction, Distraction." Rather than getting upset with our son for exploring new things that he shouldn't be into, which is inherently what children do to learn, we will introduce something else to him to distract him. Giving him something he can have usually dissuades him from playing with something he can't have. For instance, we gave him his own kitchen drawer with his "kitchen stuff" in it. This keeps him out of off-limits cabinets and allows him to explore. We are also now becoming experienced negotiators with our son. After about age one, he began to possess the ability to understand "if you do this, then this happens" logic. If Lukas stops half way through his dinner and asks for a cookie, we make a deal. Finish this amount of your dinner (usually plenty for a 20 month old) and then you can have a cookie. He will then eagerly finish that food in anticipation of the payoff. If he has played in the house and wants to go outside, we tell him that we can go outside once we have cleaned up most of the toys scattered about. Again, this does the trick. To my amazement this is working tremendously well so far. I'm not fooling myself into thinking that we will always be this successful negotiating with Lukas, but am actually fairly surprised at how well it is currently working. Often, in the midst of completing the negotiated task, he will have forgotten about what he originally wanted. Lukas seems to be a bright kid, but he also is a good-natured boy as well. And, we praise as often as we can when he does things right - like petting the cats instead of hitting them! Every day is a new experience for first time parents. How about you, readers. How much do you negotiate with your young children? How has that worked out? As for us, for now we will just continue to deal with challenges as they present themselves. Lukas has been hopping around quite a bit lately with his hands curled up in front of his chest. Each time I see him do this, I can't help but laugh out loud. He had especially good hops at daycare dropoff this morning. Seriously, this is what it looks like. I think I'll stop by Trader Joes tomorrow to pick up a couple of coconuts so I can follow behind him and provide sound effects. On a side note, there have been no more of these diapers this whole week. Must confirm he's Royalty! Just the other day, someone at work asked me about life growing up on a Dairy Farm. "Wasn't it idealic?" they asked. "You must have really loved your childhood." True enough. I grew up with acres of land to explore, a river running through it, and a home where our nearest neighbors were much more than a stones throw away. Yes, it was terrific. But it wasn't all sitting on fence rails, fishing and picking four-leaf clovers. Not at all! Case in point: My first job. I had participated in certain chores around the farm since I was old enough to walk. That's how you roll when you're a farm boy. But my first official job was far from the glamourous paper routes or lemonade stands that many city kids enjoyed. No, for my first job I was placed in charge of the Pee Bucket. Warning . . . the following description is graphic. Back in the early 70's our dairy had a flat milking parlor. This meant that, instead of the cows standing on waist-high grates to be milked, they were brought into a room with a flat concrete slab. No grates, just a shallow channel behind them - with no drain. So, when these milk cows decided it was time to relieve themselves (which, by the way, happens constantly) someone needed to run up behind them and catch the said waste. Yes, you guessed it. At the tender age of approximately 7 years old, I was dipatched to keep an eagle-eye focused on batch after batch of milk cows lined up 8 in a row. And, whenever anyone in the parlor spotted a tail lifting or a hunching back (sure signs that an liquid onslaught was coming), the loud cry went out "PEE BUCKET!" It was then my duty to run over and grab a rusty old 3 gallon metal pail and hold it up as close as I could behind the urinating animal to successfully catch as much of the steaming hot pee as I could. All the while I had to move the bucket back and forth until the bitter end as the flow fluctuated in strength and the urine spattered off the bottom of the metal pail, pelting my averted face like raindrops on a late autum morning. I then had to gingerly lug the full pail of steaming yellow fluid to an open door, using care not to make any sudden move which would send it sloshing over the sides, increasing the odds of my slipping, falling and dumping the whole bucket all over me. I did this for at least 5 years after school and on weekends. Idealic? Now you know why farmers really have kids. And I'm not even going to mention what we had to do with the shovel. I think I'll discourage the lemonade stand for Lukas and push him towards a paper route. Along with the joys of parenthood come several add-ons. These are things that were completely unexpected when originally contemplating my joyful and fun-filled days of impending fatherhood. For instance, I had no clue - not a one - that I would get to strip my kid naked each night and let him run wild through the house as we prepared him for his nightly bath. Turns out, it is a lot of fun. Who would have guessed that? I also had a fuzzy brain about the whole extent I would go to keep the house relatively chaos free in the wake of a mobile and curious child who must explore the full extent of his books and toys until they are disbursed in several healthy piles scattered about our home each day. I have discovered that I need a semblance of order, and will spend ample time following behind and picking up after Lukas. I'm sure I will eventually succumb to reality and just allow the chaos take complete control. But for now I still pick things up. Certainly one thing that I never envisioned before having a child, was the lengths I would allow myself to go in taking a bite here or there off my child's dinner plate. After work I come home and start dinner, but all the time my hunger is building. Lukas, however, has eaten a late snack, nursed when he came home, and often is not all that interested in his dinner. You know, It all started so innocently. Lukas doesn't touch his spaghetti . . . so while clearing the table I finish it off. I wouldn't want to waste it, there are starving people around every corner. Not eating that chicken buddy? Daddy will test it for you. But what begins to happen is much less appetizing. Lukas has only slightly pawed at his food. What the hey, it's still good. Lukas chewed up that meatball but spit it out on the other half of the plate, but this half is still good. I don't see this heading in a good direction. What's next? When Lukas is hungry and likely to finish his meal will I get desperate and resort to diversionary tactics to sneak a bite of his fingered fare? "Lukas, is that Elmo over there?" Help me readers! What can I do? I don't want to end up digging my hands into my son's plate at a fancy restaurant when he is, say 1o or 12 years old. This is not looking good at all. I still vividly remember two specific times during my adult life when I found myself in the presence of something so wonderful and unique to humanity that I completely forgot myself. During these two times, I was struck with such a sense of awe and wonderment that I can still recall both experiences with clarity. The first was when Mrs. LIAYF and I were traveling in Italy a few years back and we day-tripped to Florence to visit the Ufizi . As I rounded a corner of the museum and spied the David I immediately understood what the fuss was about. Both Mrs. LIAYF were so overcome by its perfection and scale that we spent nearly an hour just gazing at the statue. It was a breathtaking experience that I won't forget. Similarly, when a Van Gogh exhibit came through Seattle a couple of years ago, I found myself transfixed with the famous painting Starry Night. It was as if I was in an empty museum alone with the painting. Everything else moved in the periphery like a blur. I was amazed that humans could create such perfection. Of course those events both happened before Mrs. LIAYF and I were parents. Today, we realized that another once in a lifetime opportunity to see something amazing was slipping away and we would have to act fast if we were going to 'experience' it. So, we loaded up Lukas and headed downtown to see Lucy's Legacy. Yes, that Lucy, the 3.18 million year old fossil remains universally understood as the most significant archaeological discovery ever made. This was the real thing, not cast reproductions. Although not human made, these fossils are understood to symbolize one step in humanity's evolution. We were excited to see this exhibit, especially Mrs. LIAYF who studied Lucy as an undergrad. We wanted to be able to appreciate this ancestor to us all. Of course, appreciation takes on a whole new meaning with a 20-month-old in tow. Once at the museum we let Lukas down (with his snack cup) to walk because he needed some excercise. He proceeded to weave in and around one after another unsuspecting patron. He brushed up against one young couple and when they looked down with startled looks on their faces, I dead-paned "Early Humanoid" which brought a chuckle and seemed to give us a pass. We finally weaved our way to the line to get into see the actual fossil remains, me schlepping all our coats and diaper bag because we didn't bring a stroller. This was up a long ramp and I had to make two running 'saves' as Lukas dropped cheese, bread and his grapes which went speedily rolling past the gathering crowd behind us. To this point in the exhibit I had caught only a couple of glances at some swords and other casted bones. But now it was our time to enter the main exhibit! We put Lukas in a carrier on Mrs. LIAYF's back so we wouldn't have to chase him around the darkened room. He didn't like this and began to fuss and squirm. We diverted our attention from the displays and attempted to appease him. Then, the crowd parted and we were there, standing in front of the actual 3.18 million year old fossilized bones and a life-sized reproduction model of Lucy. Amazing. However, we had no time to be overwhelmed. Lukas began to fuss again. "Lukas, it's Lucy" we said as we gazed at the model. "What do you think?" To which he promptly replied rather loudly "Oooo, Oooo, Ooooo. . .Aaaah, Aaaah, Aaaah!" Granted, she was hairy and very apelike, but that was our cue to go. Granted, this blog is "Luke, I am Your Father" but I thought it high time I pen a post that is not at all about my little guy. Not about how he is speaking in sentences. Not about how he is rapidly learning his colors and can call many of them by name when turning the pages of his Richard Scarry "Colors" book. Not about his sleeping habits. Nor about his future career possibilities. You can see I haven't put a lot of thought into where I take this from here. Unfortunately, beyond my life with my wife and my son I really don't have large list of topics to blog about. Yes, I am that boring. I don't have television in my home, so I'm even slowly losing touch with what is happening outside my sphere of influence. I am ok with that for now, but it does have it's down side when searching for interesting topics. Ok, thinking . . . Ya know, this is actually harder than I thought it would be. Music! I knew inspiration would come along. Ok, I am really into music and discovering new bands. Ours is a very musical family - we listen to music all the time, make up goofy songs to ordinary events, dance around the house, and are all mad kazoo players. Music is one of the things we can enjoy together that doesn't interrupt our family time (unlike TV). In fact, part of my job as "Head of Household" (my wife is rolling her eyes) is to find new music for our home. With that in mind, here is a short list of personal musical finds I have made over the past few months. Some you may be very familiar with and some you might never of heard of before. But check them out and let me know what you think. (*OK, these last three are not recent discoveries, but we do dig these bands). Go ahead and leave a comment and let me know the bands you have recently discovered. I would love to check them out too. I just thought I should put that out there now. I want to be able to look back on this post at the inevitable, but temporary, moment in the distant future when I'll be wondering what sort of evil demon took control of my brain and shut down my powers of logic, convincing me to agree to Mrs. LIAYF's impassioned plea to reproduce. But, is it really inevitable? Tonight, I'm not so sure. The whole LIAYF staff has returned safe and in one piece from our trip to San Francisco. Rumors of our demise were greatly exaggerated! My son and wife have given me renewed confidence in our ability as a family unit to weather change and stressful situations and emerge from them smelling like a rose. Ok, Luke didn't exactly finish up the vacation smelling like a rose, or anything remotely floral, but that's a story for another paragraph. We left for the extended weekend wondering and a bit nervous about how Lukas would react to sleeping in unfamiliar surroundings. We scheduled the first leg of the flight to correspond to his nap schedule and this worked like a charm. As soon as the plane lifted off, Lukas turned his head to look out the window, then promptly fell asleep for the duation of the flight! Sleeping in the hotel rooms? Not problem either as his sleeping schedule was spot on for the first three days and we had a great time visiting San Francisco, riding the trolleys, seeing the waterfront, and going to the aquarium at Golden Gate Park with Mrs. LIAYF's family. That's not to say everything went perfectly. I caught the stomach flu and spent much of Saturday night purging my system of everything I had eaten for the last week. The vacation had gone so well with Lukas' sleep, so I tried very hard not to wake anyone up as I lay in misery first on the hotel bedroom floor, then finally on the bathroom floor at 3 a.m. To her credit, Mrs. LIAYF came to my rescue with water, comfort and lots of soothing. We worked well as a team on too little sleep to keep Lukas entertained and happy the next day, and thank goodness neither my son nor wife caught the nasty bug. (BTW - I felt better, though very weak, for the last day of our trip). While the visit was good, our day of departure was semi-hellish. Mrs. LIAYF and I will have to take credit for this however as we, in our infinite wisdom, scheduled a 10:30 p.m flight home. We did this to maximize our vacation time and with the false hope that Lukas would fall asleep and stay that way during all the transitions with the car rental, airport security, boarding, off loading, baggage claim, shuttle to off-site parking, and unloading at home. Yes, that was seriously wishful thinking because he wouldn't nap on Sunday. So, we ended up with a 20 month old who from 6:30 a.m. to 2:30 a.m. the next day, had a grand total of maybe 3 hours sleep. Needless to say, he was not a happy child. Lesson learned. The 2:30 a.m. bedtime did result in a later morning wake-up at 8:30 a.m. Monday which gave Mrs. LIAYF and I a chance to catch up a bit too. However, we woke to the an epic diaper explosion the likes of which have never been witnessed before in this household. To put it bluntly, there was sh*t everywhere. Think of this scene from Slumdog Millionaire and you have a sense of what we were dealing with. Now though, we are much wiser to pitfalls of air travel with a toddler. All in all, the trip was a great sucess. It was great to see family, and San Francisco left us wanting to return soon. I plan on posting about our experiences there over on Uptake.com once I am able to dig myself out from under the pile of work that now awaits me. Despite all that, it's very nice to be home. Just your average guy, living in the greatest city on the planet, with the best son ever, the world's best wife, and now the world's best daughter to boot. Did I leave anything out...? I have to wipe his what?